This is one of the most combo-ready cards in Unstable, and it’s also one of the most crazy in a good way and fun in the best way. One hundred luck counters to win means it’s not a great idea to just throw it into a deck with other dice-rolling cards – though I admit I am tempted by the prospect of getting this in play and ramping into a ridiculously high value of X for Ol’ Buzzbark – yet the fact that it counts any die you roll for any reason is a big plus. I know it’s mentioned two other times on this page, but Sword of Dungeons and Dragons definitely counts, and it counts twice or more when you start with cards like Relentless Assault, or even just equipping it to a Boros Swiftblade. The risk, of course, is that that’ll end the game by damage rather than by combo, but just keep it in mind against people who think it’s cute to gain infinite life. I wonder how this interacts with Krark’s Other Thumb – do you count both rolls for As Luck Would Have It? Does the “ignore one” clause count only for the effect you’re “actually” rolling it for? Today we are looking at “The Unstable Helix Pinnacle.” Like most alt-win cards, you play As Luck Would Have It only if you have a deck built around it. Fortunately there are quite a few good dice rolling cards. In Limited Willing Test subject and Mother Kangaroo can get out of hand and are great combo pieces. Speaking of which, Sword of Dungeons & Dragons is amazing with this card. If you get lucky you can get over 30 counters in a single turn. 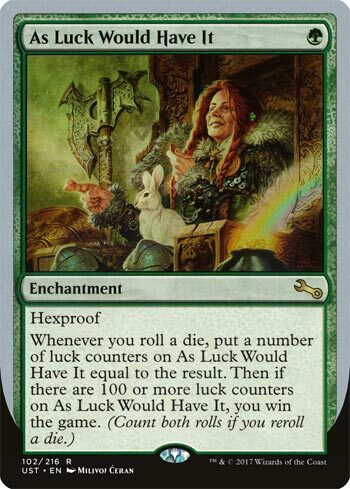 As Luck Would Have It is reminiscent of Helix Pinnacle from Eventide, though serving as a way to turn dice rolls into something more meaningful. While you’re getting an average of 3.5 counters each time you roll a six-sided die, it means that you have a bit of inevitability if you have a way to keep the dice rolling. This also pairs well with Sword of Dungeons and Dragons, since that d20 you’re rolling is still a die. If dice rolls were a part of black-bordered Magic, this would be a perfectly reasonable card. Even as-is, it’s still a nice win condition for a deck tailored to take advantage of it.